Camp Sunshine supports children with life threatening illnesses and their families. Located in Casco, Maine, the camp has the distinction of being the only program in the nation whose mission is to address the impact of a life threatening illness on every member of the immediate family—the ill child, the parents, and the siblings. Since its inception, Camp Sunshine has provided a haven for over 30,000 individuals from diverse cultural backgrounds. 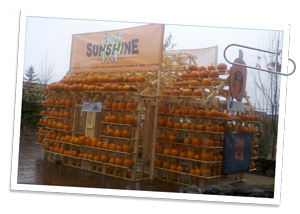 Perspective Construction Management donated the design and construction of features for Camp Sunshine’s L.L.Bean Pumpkin Festival, a “sponsor-a-pumpkin” fund raising event that takes place annually.